“Adobe Flash Player Was Not Found” scam is the PUP that uses misleading techniques to prevent removal. Use Reimage to locate malicious components and get rid of them faster than with uninstall instructions. A full system scan blocks virus reappearance and prevents traffic to malicious domains. 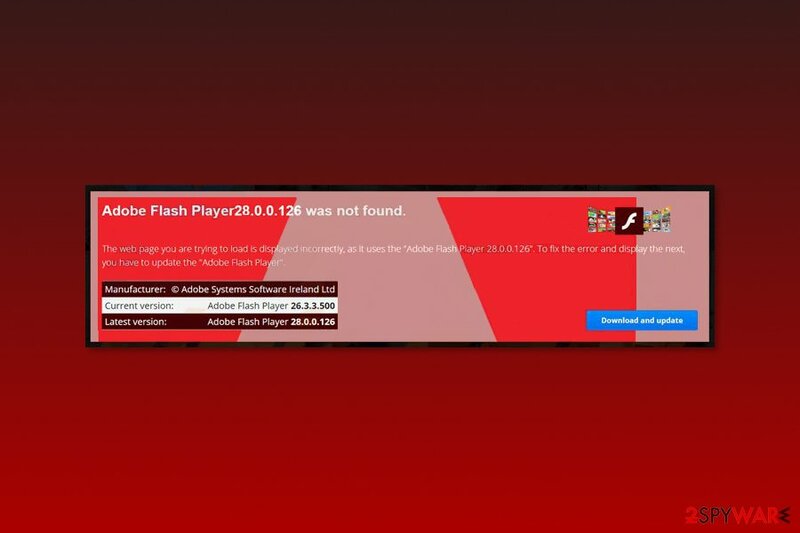 “Adobe Flash Player Was Not Found” is a pop-up that alerts about missing Flash Player that is required for displaying content on the particular website. However, this notification is not legit and tricks users into installing unknown and potentially dangerous software on the computer. Users are usually redirected to “Adobe Flash Player Was Not Found” scam website once adware sneaks inside the computer. This potentially unwanted program (PUP) might arrive on the system together with freeware or shareware. Then it makes modifications to the system and web browser and starts annoying activities. The web page you are trying to load is displayed incorrectly, as it uses the “Adobe Flash Player 28.0.0.126”. To fix the error and display the next you have to update the “Adobe Flash Player”. Unfortunately, credentials make this notification look legitimate. However, users should be aware that software updates are not delivered in this form. Thus, you have to ignore “Adobe Flash Player Was Not Found” and do not download anything from such site. However, the scam seems similar to “The HoeflerText font wasn’t found” ads, “The Mercury Text Font Was Not Found” virus and similar cyber threats that were trying to trick users into installing fake updates. In this way, criminals trying to make people installing malware, ransomware or data-stealing trojans to the system. If you are continuously redirected to this website, you should check the system for the adware. The quickest way to do it is to obtain anti-malware software and scan the device. Tools like Reimage will remove “Adobe Flash Player Was Not Found” malware within a couple of minutes. However, you can also scroll down to the end of the article where you can find manual “Adobe Flash Player Was Not Found” removal instructions. But we want to remind that it might not be easy to locate all adware-related components. "Adobe Flash Player Was Not Found" scam tries to convince people to install fake Flash Player update. “Adobe Flash Player Was Not Found” pop-ups seem to appear out of nowhere. However, they are triggered by adware program which usually arrived on the system bundled with freeware or shareware. PUPs are often attached as optional components to various free programs you can download from the Internet. The hijack occurs when users rely on Quick/Recommended installers that do not openly disclose about third-party software that is offered to download together. However, using these settings users give indirect permission for PUPs to get on your PC. If you are frequently being redirected to scam website, you have to remove “Adobe Flash Player Was Not Found” adware from your computer. We highly recommend using anti-malware software for this task. However, you can do it manually too. You can find manual “Adobe Flash Player Was Not Found” removal guide below. Please follow them carefully. If you leave some adware-related apps, extensions or files, these annoying alerts will come back to your Chrome, Firefox, Explorer or another web browser you use. Follow the guide to remove adware which is responsible for redirecting to “Adobe Flash Player Was Not Found” scam site. Additionally, reset affected web browsers. Here, look for “Adobe Flash Player Was Not Found” scam or any other recently installed suspicious programs. To terminate malware-related components from the Mac OS X, follow the steps below. Additionally, you should reset your web browsers to stop redirects to “Adobe Flash Player Was Not Found” website. Wait until you see Applications folder and look for “Adobe Flash Player Was Not Found” scam or any other suspicious programs on it. Now right click on every of such entries and select Move to Trash. When in the new window, check Delete personal settings and select Reset again to complete “Adobe Flash Player Was Not Found” scam removal. Once these steps are finished, “Adobe Flash Player Was Not Found” scam should be removed from your Microsoft Edge browser. Here, select “Adobe Flash Player Was Not Found” scam and other questionable plugins. Click Remove to delete these entries. Now you will see Reset Firefox to its default state message with Reset Firefox button. Click this button for several times and complete “Adobe Flash Player Was Not Found” scam removal. Here, select “Adobe Flash Player Was Not Found” scam and other malicious plugins and select trash icon to delete these entries. Click Reset to confirm this action and complete “Adobe Flash Player Was Not Found” scam removal. Here, select Extensions and look for “Adobe Flash Player Was Not Found” scam or other suspicious entries. Click on the Uninstall button to get rid each of them. Now you will see a detailed dialog window filled with reset options. All of those options are usually checked, but you can specify which of them you want to reset. 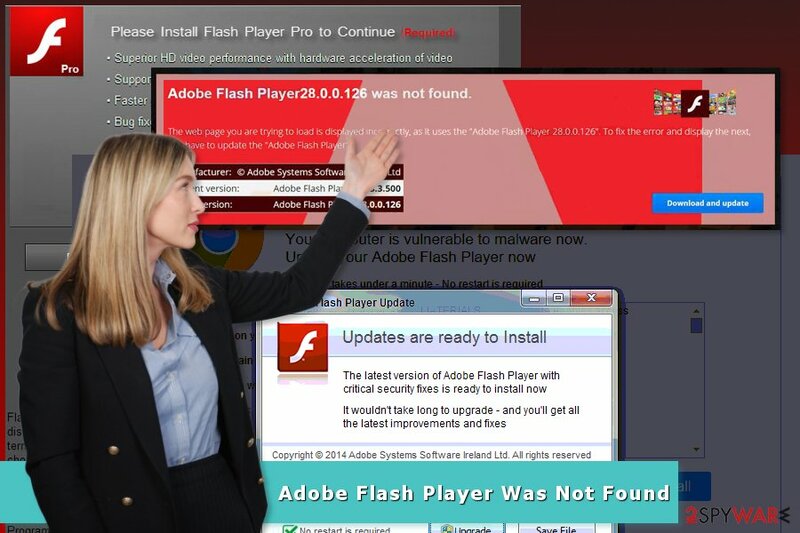 Click the Reset button to complete “Adobe Flash Player Was Not Found” scam removal process. ^ Derek Erwin. How to Tell if Adobe Flash Player Update is Valid. 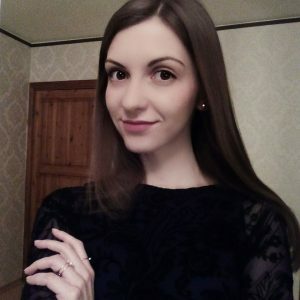 Intego. Mac security blog. ^ Fake Adobe Flash Update Installs Ransomware, Performs Click Fraud. Symantec blog. Cyber security bog. ^ Virusler. Virusler. Security news and malware reports. This entry was posted on 2018-01-16 at 09:40 and is filed under Malware, Viruses. You can quickly scan the QR code with your mobile device and have “Adobe Flash Player Was Not Found” scam manual removal instructions right in your pocket. How did you remove “Adobe Flash Player Was Not Found” scam?